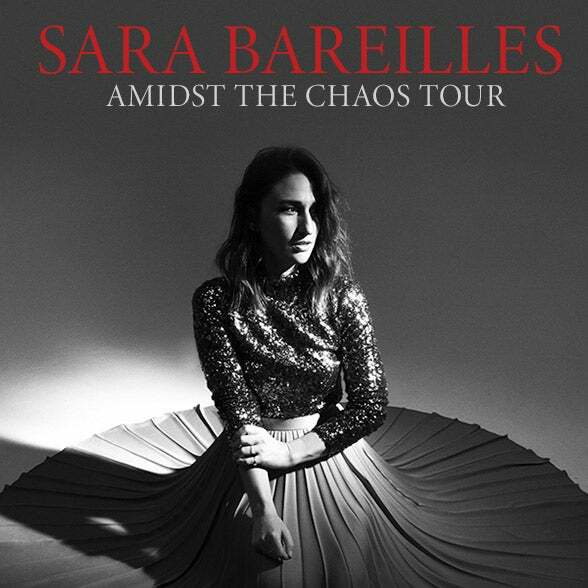 Grammy, Tony and Emmy award-nominated singer, songwriter, actress, and author Sara Bareilles today announced her Amidst The Chaos Tour. Produced by Live Nation, the 30-city tour will kick off Oct. 5 in Detroit, MI and make stops in Boston, Chicago, Houston, San Francisco and more, before wrapping Nov. 26 in Atlanta, GA. The tour will also include stops at the iconic Madison Square Garden in New York City and the famous Hollywood Bowl in Los Angeles, CA. The tour brings Bareilles on the road in support of her fifth full-length album Amidst The Chaos which was just released last Friday to rave reviews - with Variety stating it "establishes that there's no one in contemporary pop better at flexing mezzo-soprano sensitivity and social empathy like a muscle. It's the perfect album for anyone who could use a little fierce snowflake pride." This marks her first album of original material since 2013. Tickets go on sale to the general public beginning Friday, April 12 at 10 a.m. local time at LiveNation.com. Sara Bareilles first achieved mainstream critical praise in 2007 with her widely successful hit "Love Song," which reached No. 1 in 22 countries around the world from her debut album "Little Voice." Since then, Sara has gone on to receive seven Grammy® nominations throughout her career, which include Song of the Year and Best Female Pop Vocal Performance for "Love Song" and one Album of the Year for her highly acclaimed third studio album, "The Blessed Unrest." Her book, "Sounds Like Me: My Life (So Far) in Song," was released in the fall of 2015 by Simon & Schuster and is a New York Times best seller. Making her Broadway debut, Sara composed the music and lyrics for "Waitress," for which she received her first Tony® Award nomination for Best Score and a 2017 Grammy® Award nomination for Best Musical Theater Album. She also made her Broadway acting debut in 2017 by stepping into the lead role in "Waitress." Live Nation Entertainment (NYSE: LYV) is the world's leading live entertainment company comprised of global market leaders: Ticketmaster, Live Nation Concerts, and Live Nation Sponsorship. For additional information, visitlivenationentertainment.com.